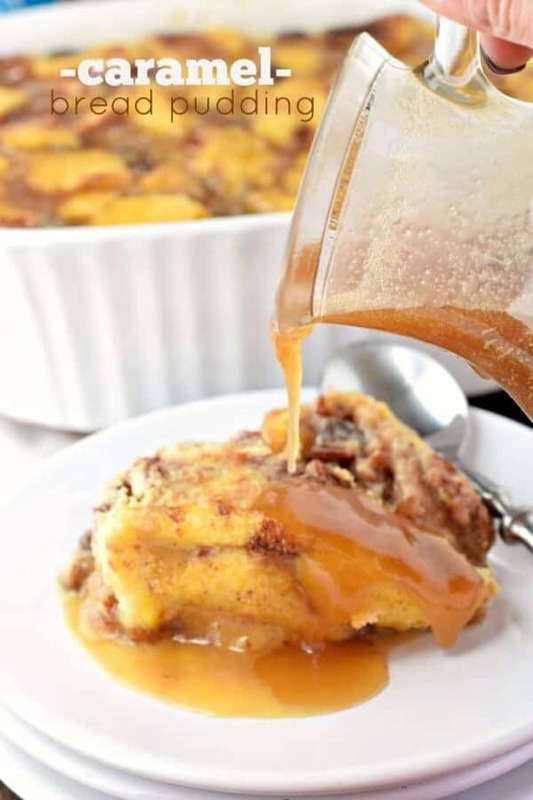 Caramel Bread Pudding has a perfect custard pudding center with a crisp outer crust! Packed with flavor and topped with caramel sauce, this is the dessert you’ve been craving! Mother’s Day is just around the corner. Do you have plans? We do the typical yard work and start the garden Mother’s Day weekend. Get the pile of mulch delivered, plan my veggies for the summer, work work work. But honestly? I love it. I’m not one to go out for a fancy Mother’s Day brunch somewhere. I’m just as happy with burgers on the grill with a side of coleslaw. However, I do love a good dessert. My dad makes an incredible bread pudding that would be perfect for any brunch or party at your house! I tweaked his recipe to give me more of the things I love. Raisins and nuts. And not just any nut. You all know by now that I absolutely love Fisher Nuts, they are preservative free and taste incredibly fresh! I packed this bread pudding with plenty of Fisher Nuts Pecans! My house smelled amazing while this baked up. And when it came out of the oven I was going to top it with a sweet vanilla glaze…but I chose to do a brown sugar glaze instead. 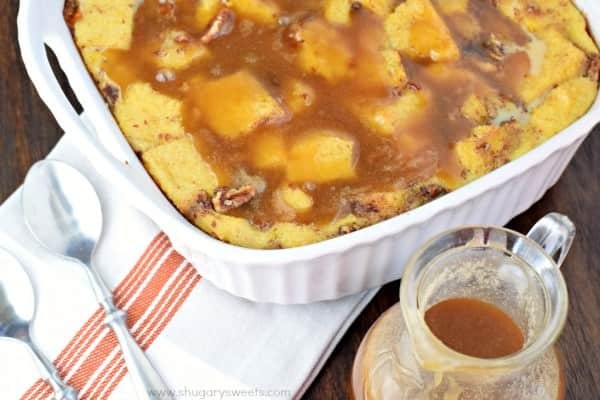 It was the perfect, caramel topping to this chunky, custard bread pudding recipe! I don’t know what your mom is wishing for this Mother’s Day, but I bet this Caramel Bread Pudding might get you on her favorites list! Preheat oven to 375°F. Lightly grease an 8-inch square baking dish or 2 qt casserole with baking spray. Set aside. In a large bowl, combine bread cubes with melted butter, cinnamon, nutmeg, raisins and chopped pecans. Mix gently until well blended. Pour into bottom of prepared baking dish. Using the same bowl, whisk together the eggs with the sugar, vanilla and salt until frothy. Add warm milk and stir until blended. Pour over bread mixture. Bake for 30-35 minutes until edges lightly brown (center will be jiggly). Remove from oven. While bread pudding slightly cools and sets, prepare caramel sauce. In a saucepan over medium high heat, combine sugars, butter and heavy cream. Bring to a boil and stir continuously. Boil (at a rolling boil) for about 2 minutes. 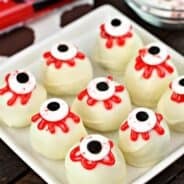 Looking for more Mother’s Day desserts? 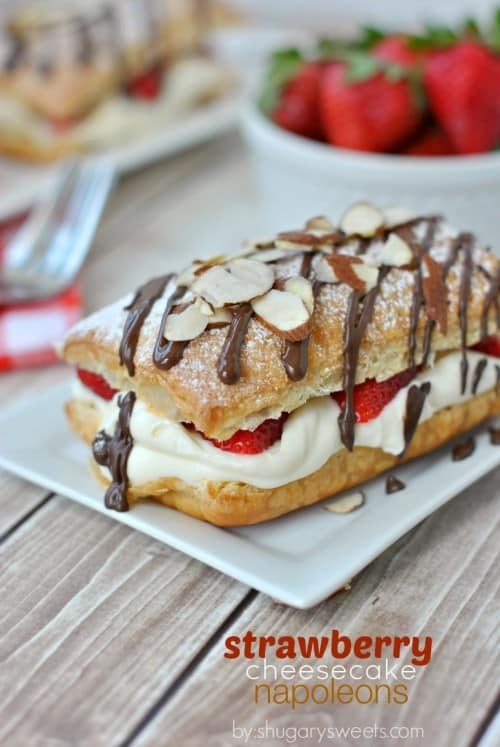 Strawberry Cheesecake Napoleons: a quick and easy recipe idea that will impress even your mother in law! 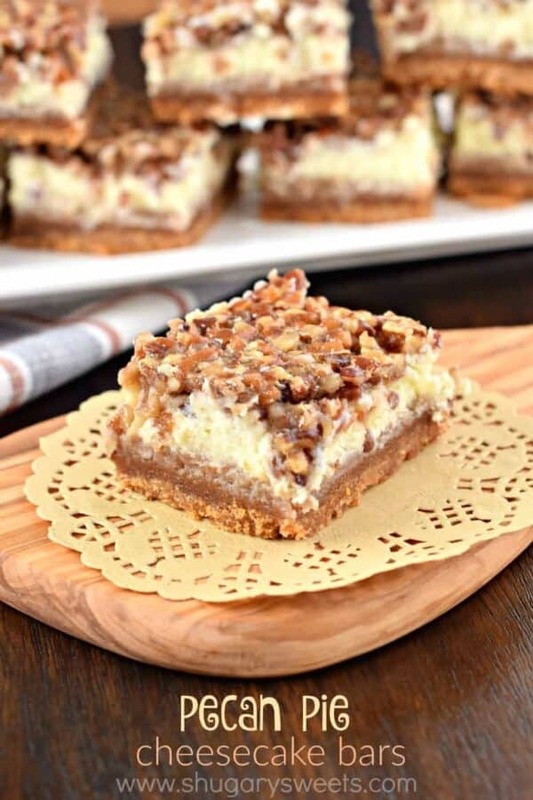 Pecan Pie Cheesecake Bars: enjoy these all year long, one of my very favorite treats to make for family and friends! 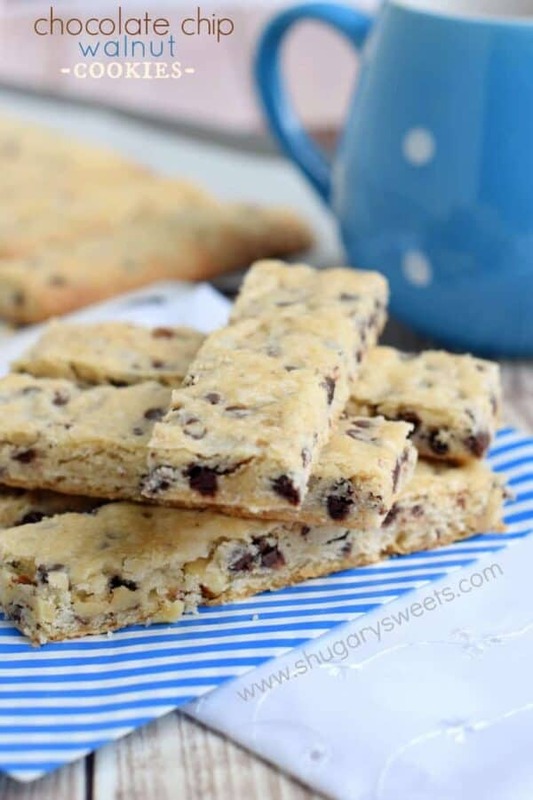 Chocolate Chip Walnut Cookie Sticks: rich, buttery shortbread cookies that are easy enough for the kids to help make for mom! 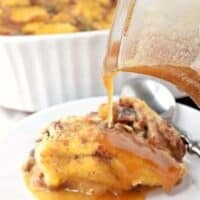 Caramel Bread Pudding has a perfect custard pudding center with a crisp outer crust! Packed with flavor and topped with caramel sauce, this is the dessert you've been craving! Preheat oven to 375°F. Lightly grease an 8-inch square baking dish with baking spray. Set aside. While bread pudding slightly cools and sets, prepare caramel sauce. In a saucepan over medium high heat, combine sugars, butter and heavy cream. Bring to a boil and stir continuously. Boil (at a rolling boil) for about 2 minutes. Oh wow, Mother’s Day is around the corner. I’m so not focused on that!! My dream is that someone would make this for me, but let’s get real. Mama’s making her own caramel bread pudding this time! But it’ll be a great present to myself! It’s worth the effort 🙂 Happy MOther’s Day! Seriously heaven on a plate. Pecans are my favourite! Yes, they definitely add so much flavor and texture to this dish! I’d love this form Mother’s Day brunch! 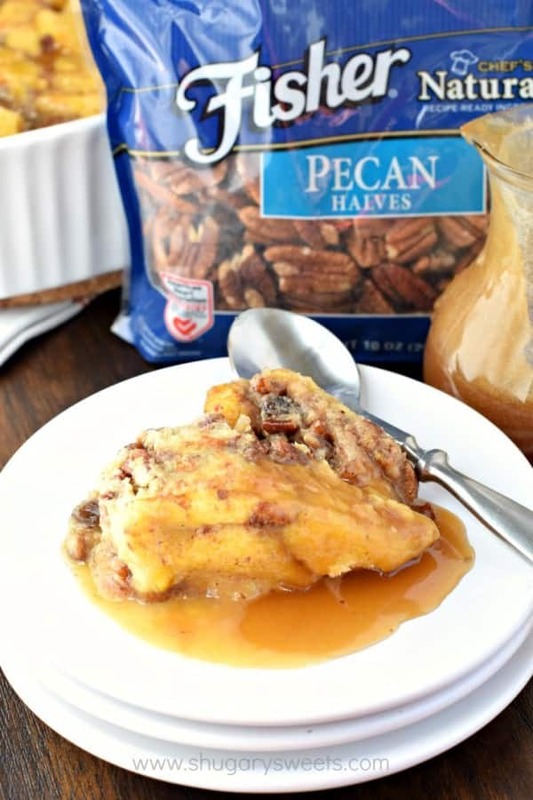 Caramel and pecans – swoon! I would gladly welcome this treat at my table for Mother’s Day! But I’m also totally fine with a relaxed dinner that’s been grilled like you! Oh Aimee! What a dessert! This looks absolutely incredible. I love ALL things caramel! Thank you! I can never resist the opportunity to add caramel to a dessert! 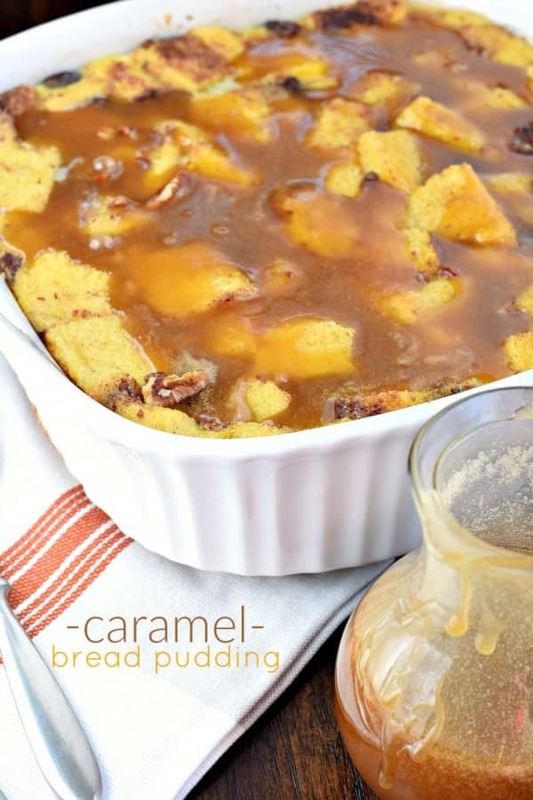 OH MY… I just love bread pudding and caramel…so now you put them together and how can I resist !! I also read thru your dad’s recipe… sounds like his might be a little more custardy…is that correct ? just going by the bread to milk ratio… WOW… I’m just going to have to try both of these, adding more raisins & nuts you can never go wrong ! 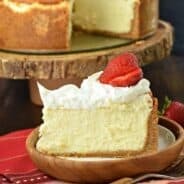 Thanks for wonderful recipe and any advise you can give me. Yes, this one is more custardy, and also has more crunch and chew from the raisins and pecans. Although, dads version is great, and the lemon glaze is wonderful on that version! This looks SOO delicious! I am sure ANY mother would love this served to them! I am thinking I’ll make this for myself for mother’s day. HEE! I’m with you on not needing a fancy breakfast but I would gladly take this for my breakfast!! It sounds like you work hard on your mother’s day weekend! This would make a great brunch! I love just having an easy meal at home on Mother’s Day, too! And you can’t beat getting out on the garden when the nice weather hits. This bread pudding…to die for! Wowza! I want my family to make this for me!!! Looks sinful! Looks insanely good…bread pudding is my favorite. No fancy plans here either! Yard work and something grilled is usually the same thing we do! Although now I totally want a pan of this gooey goodness! I need to put one of my kids to making this for sure!!! 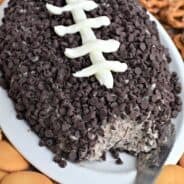 you’re right-this IS the dessert I’ve been craving! !